Happy Christmas Eve! It’s cold outside and I hear it’s gonna get colder next week with possible snow. 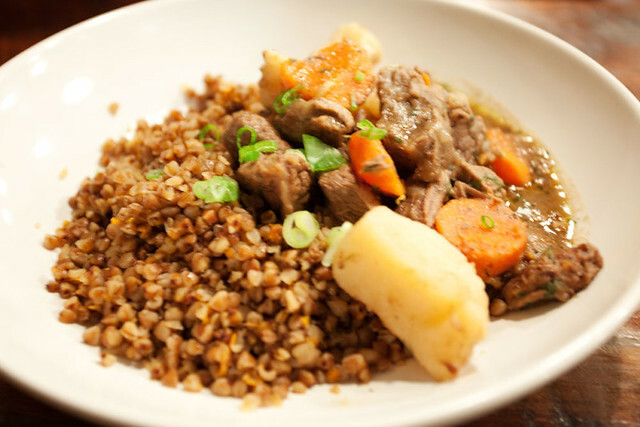 Well you know when it gets cold most people tend to crave for heartier foods like stews and such. At Karloff, besides serving some great latkes, they also serve stroganoff, stews, dumplings and other non latkes stuff. So just a week after my 1st visit I took a friend there for dinner. Well our goal that night was to have dinner at Mile End but they were PACKED!!! As we walked in my friend made a comment about how cozy it feels, it certainly was. It was nice and quiet and calm. I knew what I wanted straight away and then my friend asked “hey wanna try the meat dumplings?” MEAT DUMPLINGS WHAT?! Heck yeah. Took my friend a little while before deciding on getting the beef stew and I got the chicken stroganoff. The waitress didn’t ask us if we wanted mashed potatoes or kasha and we ended getting the kasha. 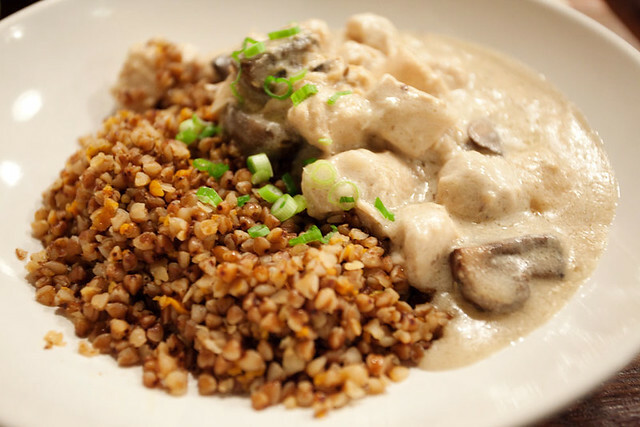 Which I was glad that happened because kasha with creamy chicken and mushroom was delicious. 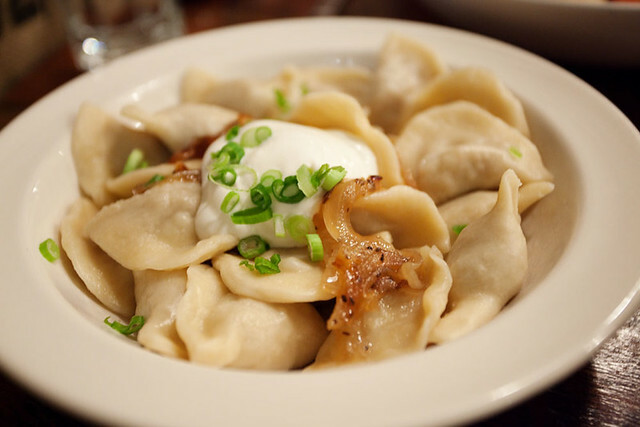 Our meat dumplings, for $8, came in 20 and was served with a dollop of sour cream and a sprinkle of caramelized onions. These babies were cute! AND TASTY! Wow these were real good. Make sure to get a little bit of sour cream and onions. What a perfect combination of hearty and comforting wintery food, though I wanted more of the dumplings after I got home that night.